Luxform Lighting Newman Spotlight in Stainless Steel. MERCURY Economy Transparent Speaker Cable, 2 x (79 x 0.2mm) NEW. Behringer SD8 Digital Stage Box / Snake. Behringer SD8 Digital Stage Box / Snake Digital mixing has revolutionized virtually everything in the live- entertainment production workflow. Ve come up with the perfect solution for connecting the onstage talent with your Front of House (FOH) console, and the rest of the world? The ultra-cool and ultra-affordable SD8 Stage Box! Without any additional hardware required. Plus the SD8 is extremely compact and comes with rugged protective bumpers, so you can toss them directly on stage wherever you need them. All it takes is a single Cat 5e cable per stage box. And If you need more inputs, or just want to keep your cable runs short and tidy, putting an SD8 at stage front and another behind the drum riser gives you an additional 8 inputs for drum and guitar/ bass amp mic? When used as part of a complete X32 system, as many as three SD8 Stage Boxes can be cascaded via the built-in AES50 ports to provide up to 24 bidirectional inputs and 24 balanced XLR outputs. 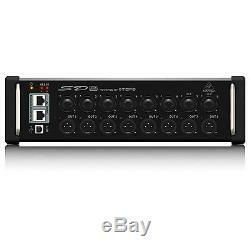 An onboard ULTRANET distribution hub provides power and 16 channels of audio to 2 BEHRINGER POWERPLAY P16-M personal monitor mixers per SD8, all via inexpensive Cat 5e cabling? And without any additional hardware. Two of the programmable inputs are also compatible with Hi-Z sources, so you can connect keyboards, acoustic and bass guitars etc. With no DI box required. The SD8 also features a USB port for fast and easy system updates via your PC. Behringer SD8 Digital Stage Box / Snake 8 MIDAS-designed, fully programmable mic preamps for audiophile sound quality 8 analogue, servo-balanced XLR outputs AES50 network ports featuring KLARK TEKNIK's SuperMAC networking capability for ultra-low jitter and latency 2-port ULTRANET distribution hub for powered connection of 2 BEHRINGER P16-M personal monitoring mixers Digital audio and control connectivity for TURBOSOUND speaker systems with ULTRANET networking capability Rack ears and protection bumpers included for installed and mobile applications. Amazon Asin B011EAUQXA Depth (mm) 145 Display Footprint (mm) 214x145x384 Gross Weight (Packaged) (kg) 3.4 Gross weight outer carton (kg) 10.9 Height (mm) 95 Item priced per 1 Net weight (kg) 2.5 Outer box (HxWxD mm) 238x456x400 Outer box quantity 3 Packaged dimensions (HxWxD mm) 214x145x384 Packaging retail box Paper weight (kg) 0.72 Plastic weight (kg) 0.18 Product Dimensions (mm) 95x333x145 Product EAN 4033653070478 Supplier Ref. 000-BKI04-00010 Transport dimensions (mm) 214x145x384 Width (mm) 333. Squire Sound & Light has decades of experience in the professional audio market. In recent years, we have broadened our scope, expanding into other areas such as. Heating, Cooling and Air Treatment. Our experience and enthusiasm, means that we can bring both quality and affordability, while always ensuring you receive the level of service you expect. We sell some of the biggest names in the Sound, Lighting and MI Industry including. Adastra, Aidapt, AGFA Photo, AKG, Altal, Alctron, Athletic, AV:Link, Audio-technica, Behringer, Bell System, Bosch, Bugers, Bulgin, Bumper, Celestion, Cheetah, Chord, Citronic, Cloud, Crompton Lamps, dbx, D-Line, Duracell, Eagle, E-Audio, Electrovision, Eminence, Energenie, EQ Acoustics, Eurocom, FxLab, GE, GP Batteries, GPO, JBL, Jem, Johhny Brook, Klark Teknik, Lighting Resources, LYYT, Martin, Mercury, MicFX, Midas, Midland, Moonraker, MR Entertainer, Neo-Neon, Neutrik, NJD, NJS, Osram, Philips, Prem-I-Air, Pure-Fit, QTX, Rackz, Rean, Samson, Sennheiser, Servisol, Soundlab, Sylvania, Tannoy, TC Electronic, TC-HELICON, TEAC, Tenura, TOA, Trantec, Turbosound, Union, Venu Fluid, WD-40, Wetroom, and Win. Goods will be delivered before 6:00pm Monday to Friday. All orders must be placed before 2.00pm for same day dispatch. We pride ourselves on our unique level of service - offering the option of same day dispatch on the majority of orders, made possible due to high stock availability and a dedicated warehouse team who ensure that all orders are completed the same day they are received - a service level that is essential in todays business climate. Remote areas : The following post code areas normally receive a 48 hour service - AB, BT, DG, FK, GY, HS, IM, IV, JE, KA, KW, MY, ML, PA, PH, SY, TD, ZE. Lead Length (mm) 1700 (1.7m) Packing Bulk. Safety bond steel 2mm 25cm 250mm stage lighting wire cable chain rope NEW. Lightweight Stereo Headphones With Orange Pads. G6.35 Bi-pin Lampholder 250W - Optikinetics Solar 250 Projector OPTI. DLINE Cable Tidy Bases White/Black/Grey pack of 6 NEW. DLINE Clip-Over white Equal Tee 50x25mm Bag of 5 NEW. DLINE Cable Tidy Spiral Wrap 2.5m Black NEW. DLINE Cable Tidy Tube 1.1m 32mm White NEW. Item arrived quickly, well-packed, perfect condition - many thanks! KLARK TEKNIK PRO DI ACTIVE DI 10A. New Showtec 30205 Par 36 Pinspot Black DJ DISCO KARAOKE LIGHTING EFFECT. Chord 171.857 DISCREET NECKBAND HEADSET MIC FOR WIRELESS SYSTEMS QTX Citronic. REPLACEMENT MIRROR DISH 85mm - CLEAR for DISCO LIGHTING EFFECT. Philips Type 7023 12V 100W FCR A1/215 GY6.35 Projector Lamp Bulb DJ DISCO KAROKE. In recent years, we have broadened our scope, expanding into other areas such as; Home, Business and Leisure Heating, Cooling and Air Treatment Telecommunications Living Aids Security? We sell some of the biggest names in the Sound, Lighting and MI Industry including;? UNIT 34 QUEENS COURT, GREETS GREEN ROAD, WEST BROMWICH. The item "Behringer SD8 Digital Stage Box / Snake" is in sale since Sunday, May 20, 2018. This item is in the category "Musical Instruments\Pro Audio Equipment\Cables, Leads & Connectors". The seller is "pookeyclara" and is located in GB. This item can be shipped to United Kingdom, Ireland, Austria, Belgium, Bulgaria, Croatia, Cyprus, Czech republic, Denmark, Estonia, Finland, France, Germany, Greece, Hungary, Italy, Latvia, Lithuania, Luxembourg, Malta, Netherlands, Poland, Portugal, Romania, Slovakia, Slovenia, Spain, Sweden, Australia, United States, Canada, Brazil, Japan, New Zealand, China, Israel, Hong Kong, Norway, Indonesia, Malaysia, Mexico, Singapore, South Korea, Switzerland, Taiwan, Thailand, Saudi arabia, South africa, United arab emirates, Ukraine, Chile.